A chicken egg, the type of egg most commonly used as food by people. 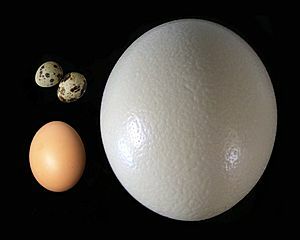 Most eggs that are eaten by humans, including bird eggs and turtle eggs, have a protective, oval eggshell, the albumen (egg white), the vitellus (egg yolk), and various thin membranes, that are layers like skin. Every part of the egg is edible, although the eggshell is usually thrown away. Eggs are a good source of protein and choline. Bird eggs have been valuable foodstuffs since prehistory, in both hunting societies and more recent cultures where birds were domesticated. The chicken was probably domesticated for its eggs (from jungle fowl native to tropical and subtropical Southeast Asia and India) before 7500 BCE. Chickens were brought to Sumer and Egypt by 1500 BCE, and arrived in Greece around 800 BCE, where the quail had been the primary source of eggs. In Thebes, Egypt, the tomb of Haremhab, built about 1420 BCE, shows a depiction of a man carrying bowls of ostrich eggs and other large eggs, presumably those of the pelican, as offerings. In ancient Rome, eggs were preserved using a number of methods, and meals often started with an egg course. The Romans crushed the shells in their plates to prevent evil spirits from hiding there. In the Middle Ages, eggs were forbidden during Lent because of their richness. The word mayonnaise possibly was derived from moyeu, the medieval French word for the yolk, meaning center or hub. The most commonly used bird eggs are those from the chicken. 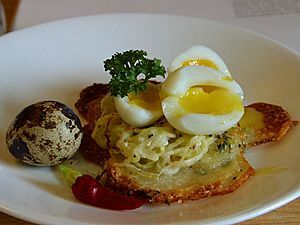 Duck and goose eggs, and smaller eggs, such as quail eggs, are occasionally used as a gourmet ingredient in western countries. Eggs are a common everyday food in many parts of Asia, such as China and Thailand, with Asian production providing 59% of the world total in 2013. 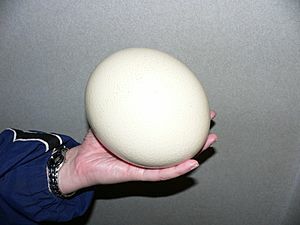 The largest bird eggs, from ostriches, tend to be used only as special luxury food. Gull eggs are considered a delicacy in England, as well as in some Scandinavian countries, particularly in Norway. In some African countries, guineafowl eggs are commonly seen in marketplaces, especially in the spring of each year. Pheasant eggs and emu eggs are edible, but less widely available. Sometimes they are obtainable from farmers, poulterers, or luxury grocery stores. In many countries, wild birds’ eggs are protected by laws which prohibit collecting or selling them, or permit collection only during specific periods of the year. In 2013, world production of chicken eggs was 68.3 million tonnes. The largest four producers were China, contributing 24.8 million of this total, the United States at 5.6 million, India at 3.8 million and Japan at 2.5 million. A typical large egg plant ships a million dozen eggs a week. During production eggs are usually candled to check their quality, depending on local regulations they may be washed, before being placed in egg boxes. The shape of an egg resembles a prolate spheroid with one end larger than the other, with cylindrical symmetry along the long axis. 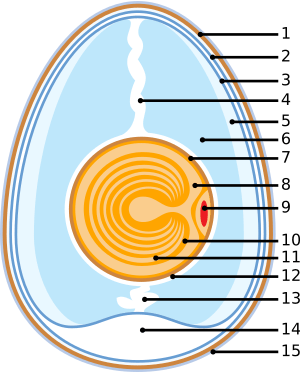 An egg is surrounded by a thin, hard shell. Inside, the egg yolk is suspended in the egg white by one or two spiral bands of tissue called the chalazae (from the Greek word χάλαζα, meaning hailstone or hard lump). The larger end of the egg contains the air cell that forms when the contents of the egg cool down and contract after it is laid. Chicken eggs are graded according to the size of this air cell, measured during candling. A very fresh egg has a small air cell and receives a grade of AA. As the size of the air cell increases and the quality of the egg decreases, the grade moves from AA to A to B. This provides a way of testing the age of an egg: as the air cell increases in size due to air being drawn through pores in the shell as water is lost, the egg becomes less dense and the larger end of the egg will rise to increasingly shallower depths when the egg is placed in a bowl of water. A very old egg will actually float in the water and should not be eaten. Egg shell color is caused by pigment deposition during egg formation in the oviduct and can vary according to species and breed, from the more common white or brown to pink or speckled blue-green. In general, chicken breeds with white ear lobes lay white eggs, whereas chickens with red ear lobes lay brown eggs. Although there is no significant link between shell color and nutritional value, there is often a cultural preference for one color over another (see 'Color of eggshell', below). Brown eggs have significantly higher incidence of blood spots due to candling being less effective. The membrane is a clear film lining the eggshell, visible when one peels a boiled egg. Eggshell membrane is primarily composed of fibrous proteins such as collagen type I. 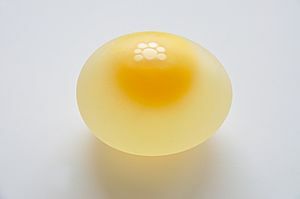 White is the common name for the clear liquid (also called the albumen or the glair/glaire) contained within an egg. In chickens it is formed from the layers of secretions of the anterior section of the hen's oviduct during the passage of the egg. It forms around either fertilized or unfertilized yolks. The primary natural purpose of egg white is to protect the yolk and provide additional nutrition for the growth of the embryo. Egg white consists primarily of about 90% water into which is dissolved 10% proteins (including albumins, mucoproteins, and globulins). Unlike the yolk, which is high in lipids (fats), egg white contains almost no fat and the carbohydrate content is less than 1%. Egg white has many uses in food, and many others, including the preparation of vaccines such as those for influenza. Yolk color is dependent on the diet of the hen; if the diet contains yellow/orange plant pigments known as xanthophylls, then they are deposited in the yolk, coloring it. Lutein is the most abundant pigment in egg yolk. A colorless diet can produce an almost colorless yolk. Yolk color is, for example, enhanced if the diet includes products such as yellow corn and marigold petals. In the US, the use of artificial color additives is forbidden. Shell-less or thin-shelled eggs can be caused by egg drop syndrome. A fried chicken egg, "sunny side up"
Chicken eggs are widely used in many types of dishes, both sweet and savory, including many baked goods. Some of the most common preparation methods include scrambled, fried, poached, hard-boiled, soft-boiled, omelettes and pickled. They can also be eaten raw, though this is not recommended for people who may be especially susceptible to salmonellosis, such as the elderly, the infirm, or pregnant women. In addition, the protein in raw eggs is only 51% bioavailable, whereas that of a cooked egg is nearer 91% bio-available, meaning the protein of cooked eggs is nearly twice as absorbable as the protein from raw eggs. As an ingredient, egg yolks are an important emulsifier in the kitchen, and are also used as a thickener in custards. 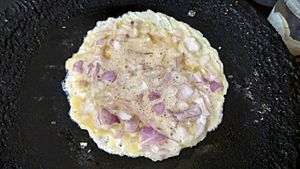 The albumen, or egg white, contains protein, but little or no fat, and can be used in cooking separately from the yolk. The proteins in egg white allow it to form foams and aerated dishes. Egg whites may be aerated or whipped to a light, fluffy consistency, and are often used in desserts such as meringues and mousse. Ground egg shells are sometimes used as a food additive to deliver calcium. Every part of an egg is edible, although the eggshell is generally discarded. Some recipes call for immature or unlaid eggs, which are harvested after the hen is slaughtered or cooked while still inside the chicken. Eggs contain multiple proteins which gel at different temperatures within the yolk and the white, and the temperature determines the gelling time. 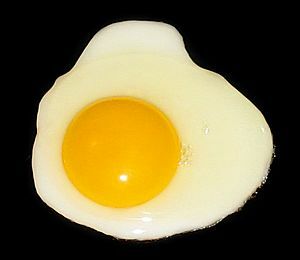 Egg yolk gelifies, or solidifies, between 65 and 70 °C (149 and 158 °F). Egg white gels at different temperatures 60 to 73 °C (140 to 163 °F)- the white contains ovalbumin that sets at the highest temperature. However, in practice, in many cooking processes the white gels first because it is exposed to higher temperatures for longer. Salmonella is killed instantly at 71 °C (160 °F), but is also killed from 54.5 °C (130.1 °F) if held there for sufficiently long time periods. To avoid the issue of salmonella, eggs can be pasteurized in-shell at 57 °C (135 °F) for an hour and 15 minutes. Although the white is slightly milkier, the eggs can be used in normal ways. Whipping for meringue takes significantly longer, but the final volume is virtually the same. If a boiled egg is overcooked, a greenish ring sometimes appears around egg yolk due to the iron and sulfur compounds in the egg. It can also occur with an abundance of iron in the cooking water. The green ring does not affect the egg's taste; overcooking, however, harms the quality of the protein. Chilling the egg for a few minutes in cold water until it is completely cooled may prevent the greenish ring from forming on the surface of the yolk. Peeling a cooked egg is easiest when the egg was put into boiling water as opposed to slowly heating the egg in cold water. Although the age of the egg and the conditions of its storage have a greater influence, the bird's diet does affect the flavor of the egg. For example, when a brown-egg chicken breed eats rapeseed or soy meals, its intestinal microbes metabolize them into fishy-smelling triethylamine, which ends up in the egg. The unpredictable diet of free-range hens will produce unpredictable eggs. Duck eggs tend to have a flavor distinct from, but still resembling chicken eggs. Eggs can also be soaked in mixtures to absorb flavor. Tea eggs are steeped in a brew from a mixture of various spices, soy sauce, and black tea leaves to give flavor. Careful storage of edible eggs is extremely important, as an improperly handled egg can contain elevated levels of Salmonella bacteria that can cause severe food poisoning. In the US, eggs are washed, and this cleans the shell, but erodes the cuticle. The USDA thus recommends refrigerating eggs to prevent the growth of Salmonella. Refrigeration also preserves the taste and texture. However, intact eggs can be left unrefrigerated for several months without spoiling. In Europe, eggs are not usually washed, and the shells are dirtier, however the cuticle is undamaged, and they do not require refrigeration. In the UK in particular, hens are immunized against salmonella, and the eggs are generally safe for 21 days. The simplest method to preserve an egg is to treat it with salt. Salt draws water out of bacteria and molds, which prevents their growth. The Chinese salted duck egg is made by immersing duck eggs in brine, or coating them individually with a paste of salt and mud or clay. The eggs stop absorbing salt after about a month, having reached osmotic equilibrium. Their yolks take on an orange-red color and solidify, but the white remains somewhat liquid. They are often boiled before consumption, and are often served with rice congee. 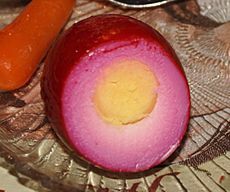 Another method is to make pickled eggs, by boiling them first and immersing them in a mixture of vinegar, salt and spices, such as ginger or allspice. Frequently, beetroot juice is added to impart a red color to the eggs. If the eggs are immersed in it for a few hours, the distinct red, white, and yellow colors can be seen when the eggs are sliced. If marinated for several days or more, the red color will reach the yolk. If the eggs are marinated in the mixture for several weeks or more, the vinegar will dissolve much of the shell's calcium carbonate and penetrate the egg, making it acidic enough to inhibit the growth of bacteria and molds. Pickled eggs made this way will generally keep for a year or more without refrigeration. A century egg or hundred-year-old egg is preserved by coating an egg in a mixture of clay, wood ash, salt, lime, and rice straw for several weeks to several months, depending on the method of processing. 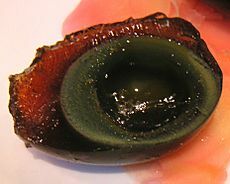 After the process is completed, the yolk becomes a dark green, cream-like substance with a strong odor of sulfur and ammonia, while the white becomes a dark brown, transparent jelly with a comparatively mild, distinct flavor. The transforming agent in a century egg is its alkaline material, which gradually raises the pH of the egg from around 9 to 12 or more. This chemical process breaks down some of the complex, flavorless proteins and fats of the yolk into simpler, flavorful ones, which in some way may be thought of as an "inorganic" version of fermentation. For those who do not consume eggs, alternatives used in baking include other rising agents or binding materials, such as ground flax seeds or potato starch flour. Tofu can also act as a partial binding agent, since it is high in lecithin due to its soy content. Applesauce can be used, as well as arrowroot and banana. Extracted soybean lecithin, in turn, is often used in packaged foods as an inexpensive substitute for egg-derived lecithin. Leguminous broths, such as chickpea brine or green pea canning liquid, also known as aquafaba, can replace egg whites in desserts like meringues and mousses. Other egg substitutes are made from just the white of the egg for those who worry about the high cholesterol and fat content in eggs. These products usually have added vitamins and minerals, as well as vegetable-based emulsifiers and thickeners such as xanthan gum or guar gum. These allow the product to maintain the nutrition and several culinary properties of real eggs, making possible foods such as Hollandaise sauce, custard, mayonnaise, and most baked goods with these substitutes. An egg just large enough to be classified as "large" in the US yields 50 grams of egg without shell. This size egg is classified as "medium" in Europe and "standard" in New Zealand. Chicken eggs, the most commonly eaten eggs, provide 155 calories (kcal) of food energy and 12.6 g of protein in a 100 gram serving (see Chicken egg sizes) (table). Eggs (boiled) supply several vitamins and minerals as significant amounts of the Daily Value (DV), including vitamin A (19% DV), riboflavin (42% DV), pantothenic acid (28% DV), vitamin B12 (46% DV), choline (60% DV), phosphorus (25% DV), zinc (11% DV) and vitamin D (15% DV) (table per 100 gram serving of a hard-boiled egg). A yolk contains more than two-thirds of the recommended daily intake of 300 mg of cholesterol (table). The diet of laying hens can affect the nutritional quality of eggs. For instance, chicken eggs that are especially high in omega-3 fatty acids are produced by feeding hens a diet containing polyunsaturated fats from sources like fish oil, chia seeds or flaxseeds. Pasture-raised free-range hens, which forage for their own food, also produce eggs that are relatively enriched in omega-3 fatty acids compared to cage-raised chickens. Cooked eggs are easier to digest, as well as having a lower risk of salmonellosis. More than half the calories found in eggs come from the fat in the yolk; 50 grams of chicken egg (the contents of an egg just large enough to be classified as "large" in the US, but "medium" in Europe) contains approximately 5 grams of fat. People on a low-cholesterol diet may need to reduce egg consumption; however, only 27% of the fat in egg is saturated fat (palmitic, stearic, and myristic acids). 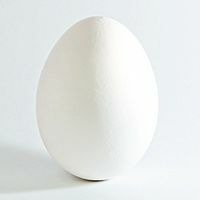 The egg white consists primarily of water (87%) and protein (13%) and contains no cholesterol and little, if any, fat. There is debate over whether egg yolk presents a health risk. Some research suggests dietary cholesterol increases the ratio of total to HDL cholesterol and, therefore, adversely affects the body's cholesterol profile; whereas other studies show that moderate consumption of eggs, up to one a day, does not appear to increase heart disease risk in healthy individuals. Harold McGee argues that the cholesterol in the yolk is not what causes a problem, because fat (in particular, saturated) is much more likely to raise cholesterol levels than the actual consumption of cholesterol. Studies have shown conflicting results about a possible connection between egg consumption and type two diabetes. A 1999 prospective study of over 117,000 people by the Harvard School of Public Health concluded, in part, that "The apparent increased risk of CHD associated with higher egg consumption among diabetic participants warrants further research." A 2008 study by the Physicians' Health Study I (1982–2007) and the Women's Health Study (1992–2007) determined the "data suggest that high levels of egg consumption (daily) are associated with an increased risk of type 2 diabetes." However, a study published in 2010 found no link between egg consumption and type 2 diabetes. A meta-analysis from 2013 found that eating 4 eggs per week was associated with a 29% increase in the relative risk of developing diabetes. Another meta-analysis from 2013 also supported the idea that egg consumption may lead to an increased incidence of type two diabetes. Eggs are one of the largest sources of phosphatidylcholine (lecithin) in the human diet. A study published in the scientific journal Nature showed that dietary phosphatidylcholine is digested by bacteria in the gut and eventually converted into the compound TMAO, a compound linked with increased heart disease. The 1999 Harvard School of Public Health study of 37,851 men and 80,082 women concluded that its "findings suggest that consumption of up to 1 egg per day is unlikely to have substantial overall impact on the risk of CHD or stroke among healthy men and women." In a study of 4,000 people, scientists found that eating eggs increased blood levels of a metabolite promoting atherosclerosis, TMAO, and that this in turn caused significantly higher risk of heart attack and stroke after three years of follow-up. A 2007 study of nearly 10,000 adults demonstrated no correlation between moderate (six per week) egg consumption and cardiovascular disease or strokes, except in the subpopulation of diabetic patients who presented an increased risk of coronary artery disease. A 2013 meta-analysis found no association between egg consumption and heart disease or stroke. A 2013 systematic review and meta-analysis found no association between egg consumption and cardiovascular disease or cardiovascular disease mortality, but did find egg consumption more than once daily increased cardiovascular disease risk 1.69-fold in those with type 2 diabetes mellitus compared to type 2 diabetics who ate less than 1 egg per week. Another 2013 meta-analysis found that eating 4 eggs per week increased the risk of cardiovascular disease by 6%. One of the most common food allergies in infants is eggs. Infants usually have the opportunity to grow out of this allergy during childhood, if exposure is minimized. Allergic reactions against egg white are more common than reactions against egg yolks. In addition to true allergic reactions, some people experience a food intolerance to egg whites. Food labeling practices in most developed countries now include eggs, egg products and the processing of foods on equipment that also process foods containing eggs in a special allergen alert section of the ingredients on the labels. Most commercially farmed chicken eggs intended for human consumption are unfertilized, since the laying hens are kept without roosters. Fertile eggs can be eaten, with a little nutritional difference to the unfertilized. Fertile eggs will not contain a developed embryo, as refrigeration temperatures inhibit cellular growth for an extended time. Sometimes an embryo is allowed to develop but eaten before hatching as with balut. In North America, the legislation requires eggs to be washed and refrigerated before being sold to consumers. This is to remove natural farm contaminants present in the cleanest farms and to prevent the growth of bacteria. In Europe legislation requires the opposite. Washing removes the natural protective cuticle on the egg and refrigeration causes condensation which may promote bacteria growth. There is no difference in taste or food value between white or brown eggs. The colour of a chicken's egg depends on the breed. 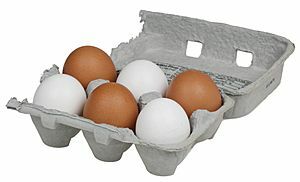 In most of the United States, eggs are generally white; while in the northeast of that country and in the United Kingdom, eggs are generally light-brown. People in Brazil and Poland prefer brown or reddish eggs, because white eggs are thought of as "industrial", that is, for use in commercial bakeries. The reason some people prefer one colour of egg and other people prefer a different colour is probably because of what the colours are linked with in their minds. For example white is linked with purity, and brown-shelled eggs with greater wholesomeness. Egg (food) Facts for Kids. Kiddle Encyclopedia.